Eastleigh's Director of Football Dave Malone today announced that the club are close to completing a loan signing. "In order to make sure 'you read it here first', I can confirm (without naming the player) that we have today agreed terms with a Conference National Club for the loan of a player well known to the Silverlake faithful! "As you know, it is our normal practice to confirm such moves only when they are completed - but rather than let you read about it elsewhere, maybe half a bit of news is better than none! "All I can say - with absolute certainty - is that (if and when) the signing is completed, I am sure our supporters will be pleased! Let the guessing game begin!" According to today's Daily Echo, midfield playmaker Will Hendry (pictured) has now agreed to a permanent deal with Eastleigh, which is believed to run until the end of the current season (2010/11). 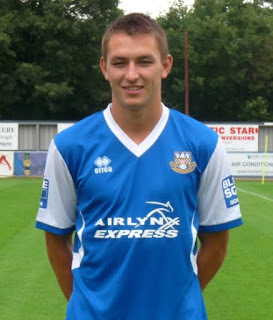 Will initially joined the Spitfires on non-contract terms in August 2010 and made his debut for Ian Baird's side on the opening day of the season against Bishops Stortford. Since then, Will has made seven more appearances including the most recent FA Cup win over Bognor Regis. Now that the talented midfielder's future appears to be resolved, the Spitfires faithful can look forward to enjoying more of the undoubted creativity and passing ability which he has already shown by laying on a number of assists in his short time with the club. Having beaten Bognor Regis by two goals to nil at the weekend in the 2nd Qualifying Round of the FA Cup; Eastleigh have an away trip to Clevedon Town to look forward to in the next round of the competition. Ian Baird’s side will travel to Zamaretto South & West strugglers Clevedon on Saturday 9th October, 3pm kick off. An Andy Forbes hat trick and two goals from Damian Scannell saw Baird's side cruise to a 5-0 demolition at the Silverlake Stadium, which meant Eastleigh had reached the 4th Qualifying Round stage for the first time. Eastleigh have since gone on to surpass that feat by re-writing history in making it to the 1st Round Proper last season (2009/10); where they came so close to an upset at Blue Square Premier side AFC Barrow. Wessex League the First 25 Years - Order your copy now! Eastleigh ensured their name will be in the draw for the FA Cup 3rd Qualifying Round following a 2-0 success at home to Bognor Regis Town. The Spitfires’ Ryman Division One South opponents fell behind to an opportunist goal by Richard Graham in the 23rd minute, a lead which was doubled nine minutes from full time by a stunning solo effort from Anthony Riviere. Ian Baird was able to name an unchanged starting eleven from last weekend’s narrow defeat to Braintree Town meaning Luke Byles was able to make his eagerly-anticipated return to the Silverlake Stadium following a spell in Australia. The Rocks had brought a good band of vocal support with them this afternoon as their side looked to make a positive start to the cup tie. Bognor’s Ben Johnson hit a speculative effort in the 7th minute, which sailed comfortably wide of Gareth Barfoot’s goal. WHEN Ian Baird last faced Bognor Regis Town in the second qualifying round three years ago, it started a chain of events the like of which had seldom been witnessed in the FA Cup. In his last game in charge of Havant & Waterlooville before his controversial move to Eastleigh, Baird guided the Hawks to a 2-1 win at Nyewood Lane which, at the time, seemed just a run-of-the-mill result. But the run kept going and going under Baird's successor Shaun Gale, resulting in that never-to-be forgotten day at Anfield where Havant twice led the mighty Liverpool in the fourth round proper before succumbing to a 5-2 defeat. Jamie Slabber set the ball rolling by scoring Havant's 81st minute winner at Bognor. Now reunited with Baird at Eastleigh, the tall ex-Spurs striker will be gunning for them again at the Silverlake Stadium tomorrow having opened the season with six Blue Square Bet South goals in nine games. A Personal hearing requested by Welling United FC to consider a charge of Misconduct levied under Membership Rule 18, for an alleged breach rule 3.3 of the Competition’s Financial Reporting Initiative, was conducted by a Panel of independent members of the Conference on Thursday 16 September. Upon the Club’s own admission that it had misled the Football Conference, Welling United FC was found guilty of Misconduct, for submitting false information relating to HMRC payments and Crown debt. The Club was deducted five (5) points from its League Table score and fined £5,000.00. The fine is suspended for two years. Although still relatively early in the season, this was a top of the table clash with Braintree sitting in second place in the Division and Eastleigh occupying sixth spot. It was also put on show; two of the leading goal scorers in the Division to date with Eastleigh's Jamie Slabber on six league goals so far this season and Braintree striker Sean Marks on eight. Eastleigh Reserves thrashed Hythe Aztecs at home in the 1st round of the Southampton Senior Cup. Alex Easton was in particularly good form in front of goal finding the back of the net four times. Ben Wilson, Jason Brookes, Chris Mason and Lewis Robinson all weighed in with a goal-apiece to complete the rout. The win came on the back of an impressive 3-1 league victory over AFC Wimbledon reserves in midweek >>http://eastleighfc.blogspot.com/2010/09/afc-wimbledon-reserves-3-1-eastleigh.html. It has been confirmed that striker Brett Williams has signed for Eastleigh on contract after his transfer from AFC Totton. The enthusiastic forward had enjoyed a successful initial month's loan with the club and will now be a permanent fixture to Ian Baird's squad. "We are delighted that Brett is back with us and we believe that he will prove himself playing at Blue Square Bet South level," commented Eastleigh's director of football Dave Malone. Brett started the season with a goal on the opening day defeat to Bishops Stortford before scoring twice against Maidenhead United in a 3-0 win at the Silverlake Stadium in late August. Williams will look to continue his excellent partnership with leading scorer Jamie Slabber in the Eastleigh attack. Last night combative midfielder Anthony Riviere played 45 minutes for Eastleigh reserves at AFC Wimbledon as he slowly builds his way back to full fitness after injury. Eastleigh Reserves took on top of the Suburban Premier League AFC Wimbledon reserves and came away with an excellent 3-1 win. Director of Football Dave Malone commented on 'Rivs' return to action that the former Fisher Atheltic midfielder "looked his normal self, and did his bit in our (surprise) 3 -1 victory." He went on to say that the club are hopeful that Riviere will be available to be part of the squad for Saturday (18th), when Ian Baird's side travel to Braintree Town in the Blue Square Bet South. 1 Fred Toomer, 2 Lewis Robinson, 3 Ben Wilson 4 Joe Crook, 5 Charlie Bailey, 6 Liam Hibberd, 7 Chris Mason, 8 Anthony Riviere (14 Tim Brasseur 45), 9 Joe Collins, 10 Liam Robinson (15 Sam Wiltshire 75), 11 Alex Easton. Subs: 12 Jordan O'Donnell, 13 Grant Blackmore. Eastleigh enter the FA Cup at the 2nd Qualifying Round and kick off with a home tie against former Conference South rivals Bognor Regis Town, who have suffered successive relegations into the Ryman Division One South. The game will be played at the Silverlake Stadium on Saturday 25th September, 3pm kick off. Ian Baird’s Eastleigh made it five successive games without defeat, notching up their second consecutive victory thanks to goals from Jamie Slabber and a bullet header to win the game from Chris Holland, six minutes from time. Following on from the impressive triumph away to Dover Athletic last weekend, Baird stuck with the same starting eleven to face Lewes at the Silverlake Stadium this afternoon. Lewes were the better side in the first half and could have had at least a couple of goals, which their play perhaps deserved. Eastleigh found themselves carved open by Steve Ibbitson’s youthful visitors, who performed admirably on the counter attack in particular; where they successfully managed to expose the Spitfires at the back. Were it not for a strong goalkeeping display from Eastleigh’s Gareth Barfoot, the hosts may well have found themselves behind at the break. EASTLEIGH boss Ian Baird has a big decision to make ahead of tomorrow's home game against Lewes - does he bring Warren Goodhind back in after suspension or stick with the side that triumphed 1-0 at Dover? Come next Saturday his defensive dilemma will be even greater for the trip to Braintree with ex-Saint Luke Byles due to fly into the country from Australia next week. With left-back Byles in the side, Eastleigh enjoyed their best ever season in the Blue Square Bet South in 2008/09, finishing in an all-time high of third. Eastleigh FC are pleased to confirm that the club have now obtained International Clearance for the signing of Luke Byles. Luke is expected to return from Australia in the early part of next week and, subject to a medical, we anticipate that he will sign a new contract to enable him to be available for selection for our game on the 18th September. Many of our supporters will remember 'Bylesy' from his previous time here at the Silverlake Stadium. He was most certainly one of our most influential players - and was integral to our team that achived a play off position in the 2008-2009 season. Lets hope he can help us do at least as well in this campaign! Take nothing away from this gritty Eastleigh performance as they returned from the shores of East Kent with a single goal victory against the previously unbeaten Dover Athletic. For sure this Eastleigh side will play a lot better this season and end up defeated such is the irony of our game. The good news for Ian Baird was the passing of late fitness tests for both Will Hendry and Richard Gillespie. Warren Goodhind was absent from the line up owing to suspension which also brought a shuffle in the side with Ross Bottomley switching to left back, Danny Smith dropping into the right back role which allowed Hendry to return to the centre of midfield and Gillespie taking the right wing berth. Terry Brown from AFC Wimbledon has been named the Blue Square Bet Premier ‘manager of the month’ for August. Brown’s side have made a great start to the season and currently sit second in the table tied on points with early leaders Mansfield Town and big-spending Crawley. The Wombles started their campaign with three straight wins. Their defence held firm as they went over 300 minutes without conceding a goal until Shane Huke found the net in their only defeat at Rushden & Diamonds. The South West London club bounced back with a hard fought 3-2 win at Eastbourne Borough before drawing with fellow promotion hopefuls Newport County on Bank Holiday Monday. Brown previously won the award in December of last season.